Unearth explores the ‘geological’ as a condition of the present. Evolving beyond the scientific study of the earth’s surface, geology has presented significant markers of time, process and matter, each employed anew by artists to contemplate our place in history. Rooted in the logic of land art and the processes of materiality, Unearth presents artistic practices that harness the elements, as method or as metaphor. Each artist’s practice draws from the physical and temporal possibilities of earth materials and is crafted in an abstract language of precise proportions. Defined by their processes, the art suggests an intuitive understanding of our present moment, unearthed from historical and mythological traditions, in parallel to the knowledge of scientific inquiry. The exhibition is a journey through ethereal landscapes, memory patterns and maps, biomorphic forms and abstractions of nature. The artists’ tendency to turn to nature is complimented by a desire to look inward. 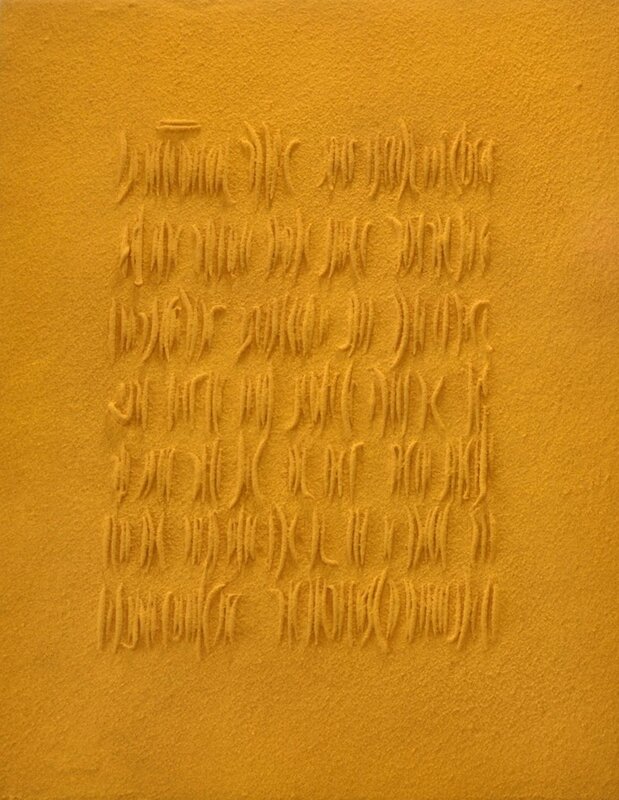 For instance, Gunjan Kumar embraces the physicality of material through the spiritual understanding of non-duality. Working with turmeric as both pigment and surface, Sifr, 2017 comprises rows of cones, made by the circular motion of the hand, while in Saafa, 2017 all but one cone is veiled behind a screen of cotton muslin. The process of making is a meditation in itself, performed through the delicate whirling of the fingers around the circumference of the turmeric cone. The origins of matter are defined by geological processes that are immeasurable, for matter is continually transformed by the substances and mediums it comes in contact with. 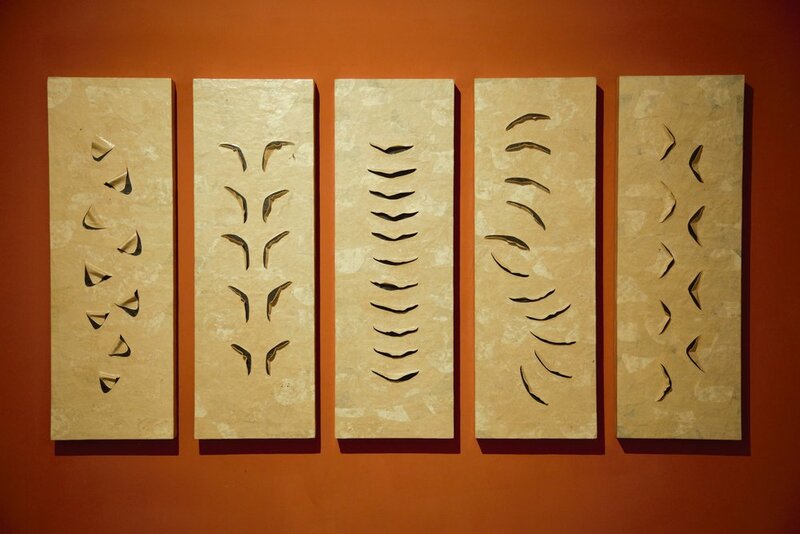 Fractioning the duration of the process is the work of Hemali Bhuta. Her nine frames of graphite rub on sandpaper present the grades of themineral in its elemental form, subverting its role as a tool for writing or drawing. Delving into the metaphysical is Astha Butail’s sculpture, Twin Sisters Dawn and Night, 2017 inspired by the Hindu Goddesses of Usha and Ratri. Celebrating the tension between the opposites that sustains all earthly life, the piece also plays off the material relationship between physical matter, its function or redundancy and the incorporeal. Manisha Parekh presents three works in hand made paper: a series of eleven Untitled paper cut drawings, 2011 that float like an orchestrated score of geometric forms, a tortured surface titled Scars, 2011 and a suite of five pulpworks titled Earth, 2016. 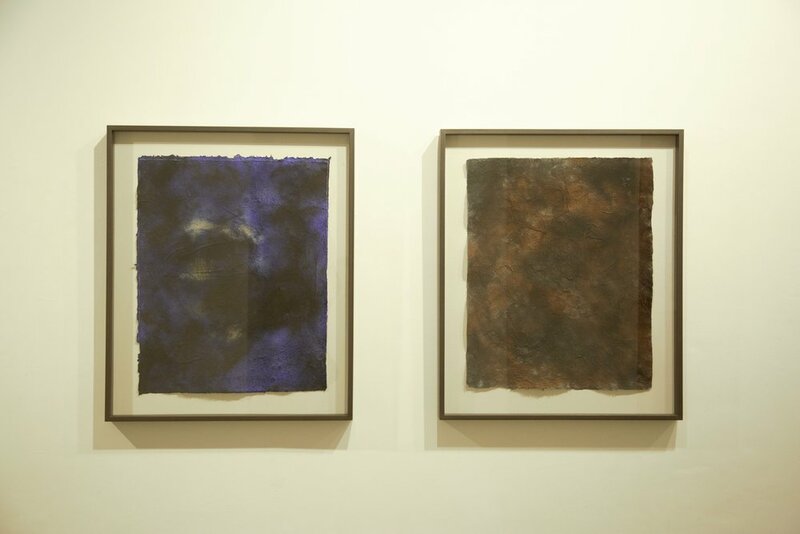 Begun as an experiment with the material, where the act of immersing in pigment lent to the discovery of a range of astral browns, reds and blues, the pulp works are textured in a manner that perhaps suggests a transient moment between the material and cosmic worlds. Arun KS’s stratified paintings reflect his interest in time, and in the keeping of memories sandwiched between its layers. With a penchant for more expansive fields, his meticulously detailed paintings are a somewhat ritualized telling of history- episodes added and eroded along the way. Sandpaper of various grades and graphite, 44" x 2" x 2"
Dwelling on the materiality of objects made of or in reference to the earth’s geological processes, Unearth questions our understanding of matter within the larger logic of the physical world that exists as is, and the unfolding of our environment, in relation to its inhabitants. Informed by the disciplines of alchemy and astronomy, craft and pre-historic traditions, the exhibition lies at the crossroad of art, science and faith and is an attempt to reconcile and recalibrate our awareness of the present with the absolute dimensions of time and space. Pellitero, Ana Moya. The phenomenological experience of the visual landscape, Research in Urbanism Series 2.1 (2011): 57-71. Astha Butail, born in 1977 in Amritsar, India unravels Indian mythology and methods of storytelling and memory. Her work is a collection of experiences, poems, sketches, stories that interact with one another. Astha Butail’s recent solo exhibition ‘Locus of Being’ was presented at& GALLERYSKE, Bangalore (2017). Her recent group exhibitions include ‘Raster Emerging from the grid’, Experimenter, Kolkata (2016), ‘Codes of Culture’, GALLERYSKE, New Delhi (2015). Her commission was presented in the exhibition ‘Fracture – Indian Textiles, New Conversations’ at the Devi Art Foundation, Gurgaon (2015). Her debut solo exhibition, ‘Manifested Ratios,’ was shown at GALLERYSKE Bangalore (2014). 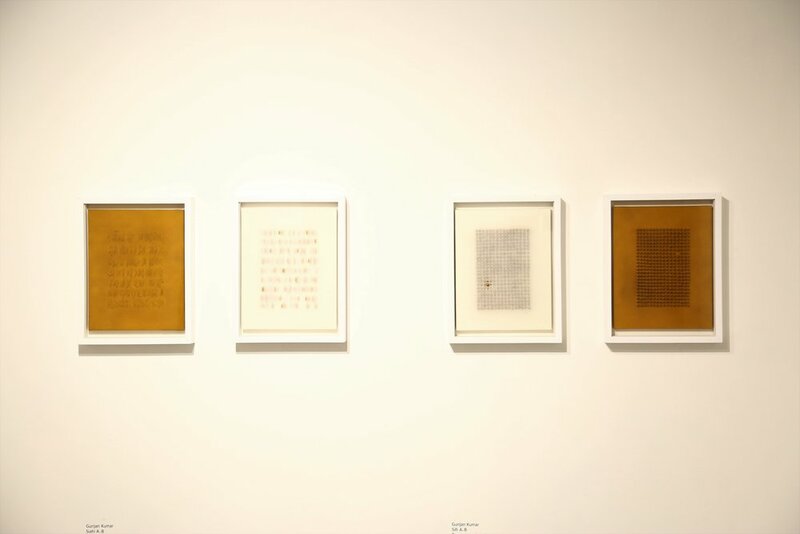 She has exhibited at Devi Art Foundation’s Sarai Reader (2013) and Masque libros Artists’ Book Fair, Madrid (2013). Her project ‘In & the Absence of Writing’has been selected for the BMW Art Journey 2017. Butail lives and works in Gurgaon, India. More than some others, perhaps, process is integral to Arun KS. 's art. And it's an elaborate one that begins with the artist collecting used, well-thumbed Bibles; he then prepares the canvas, covering it with several layers of brown paper, paper pulp, and many coats of watercolor wash, before painting on it, often covering the entire surface with abstracted images associated with his Christian faith. Finally, he cuts out pages from the Bibles and sticks them carefully so as to cover the entire painted area. 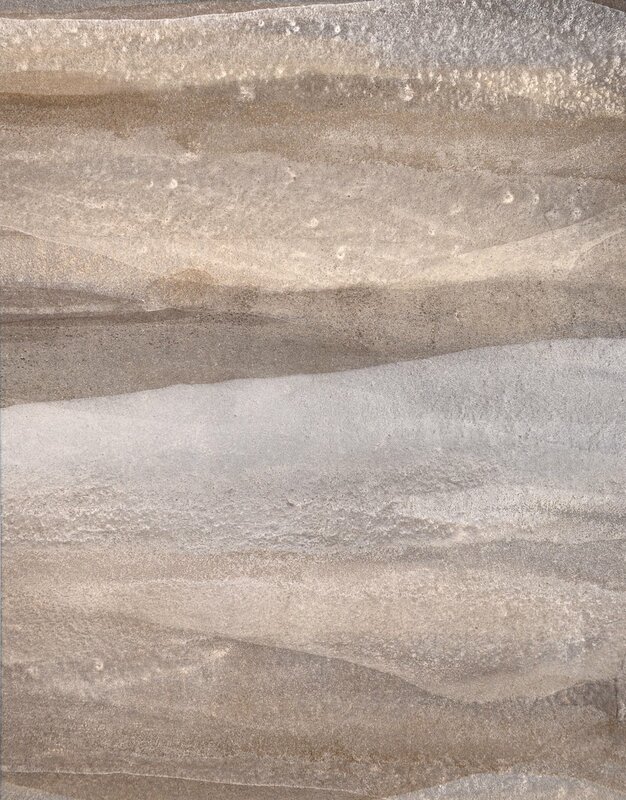 Each layer is also punctuated with a careful rub down with the sander to give the surface of the canvas a smooth and glossy finish, deceptive because it masks the many layers that went into its making even as it hints at a complex maelstrom of painted effects and hidden imagery. The final result is akin to a tapestry, carefully and densely wrought with each little detail adding to the immersive effect of the entire piece. Arun’s painterly process is, thus, not just as a mode of painting but a visual embodiment of abstraction — beginning with the “real” and then carefully chipping away at it to make the inherent forms, textures and shapes visible. Gunjan Kumar is born and raised in Punjab, India. She is an Economics Graduate and has studied Textile Design from National Institute of Fashion Technology, New Delhi. She has keen interest in age-old methods, archeology, pre-historic and tribal arts and has traveled extensively exploring her interest in these areas. These experiences form the undertone of her artistic practice. Self-taught in arts, she uses ground earth and minerals like shell oysters, clay, calcium carbonate, turmeric etc. 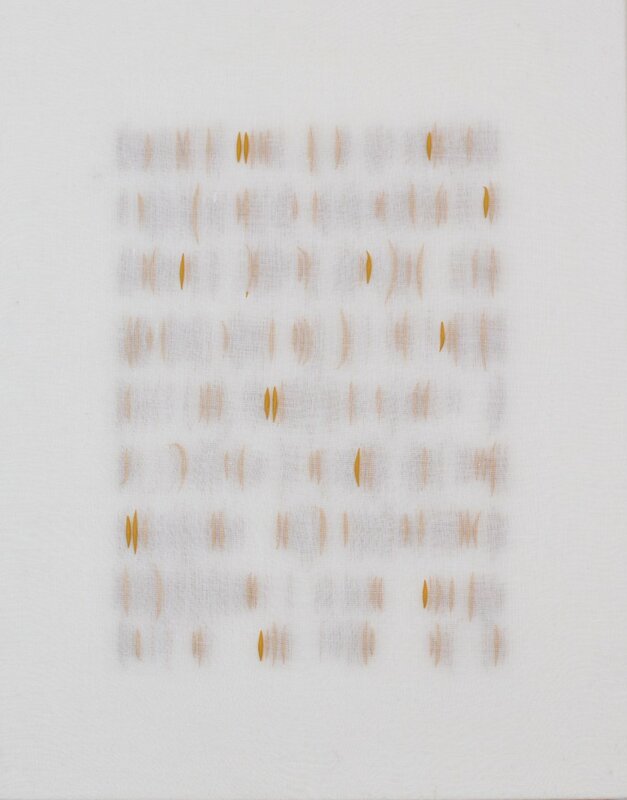 as her core mediums, meticulously applied on Japanese paper, using a self-developed technique inspired by traditional methods. She is a fellow at the Edward Albee Foundation (2016 – 2017), New York and is working on three forthcoming shows in 2017, a four-person show at the Ukrainian Institute of Modern Art, Chicago, a two- person show at the Chicago Art Department and a solo show at the Olivet Nazarene University, Bourbonnais, Illinois. Manisha Parekh was born in Gujarat in 1964 and raised in New Delhi. She holds an M.A. in painting from both the Royal College of Art in London (1991-93) and the M.S. University in Baroda (1983-1990). She was one of the founding members of Khoj International Artists Workshop. Parekh is one of the few artists working in India today who continues to explore an exclusively abstract language. 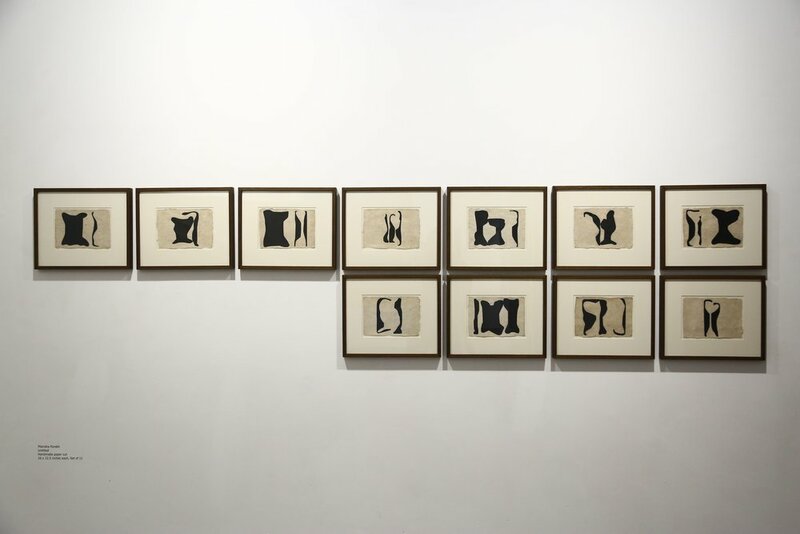 It could be said that her works are indebted to the ethereal abstractions of Gaitonde and the geometric draftsmanship of Nasreen Mohammedi (who was one of her teachers in Baroda), as well as the more gestural ink drawings of Jeram Patel. She has developed an artistic practice which also pays reference to the craft and textiles traditions of her native land. The artist straddles painting, collage and drawing to create works that incorporate both the geometric and the organic. Her most recognized works are created by layering shapes cut from handmade papers into dense fields of pattern and energy, sometimes perforating the surface and adding other materials. Numerous solo shows of Parekh's work have been held across the world, most recently at the Dr. Bhau Daji Lad City Museum, Mumbai and her work is part of public and private art collections in India and internationally, including the Kiran Nadar Museum of Art, Delhi, Lalit Kala Akademi, Ahmedabad, Jehangir Nicholson Collection, Mumbai, Royal College of Art, London, Davey & Chester Herwitz Collection, Boston, Heinrich-Boll-Stiftung, Cologne, and Robert Lodar Collection, London. 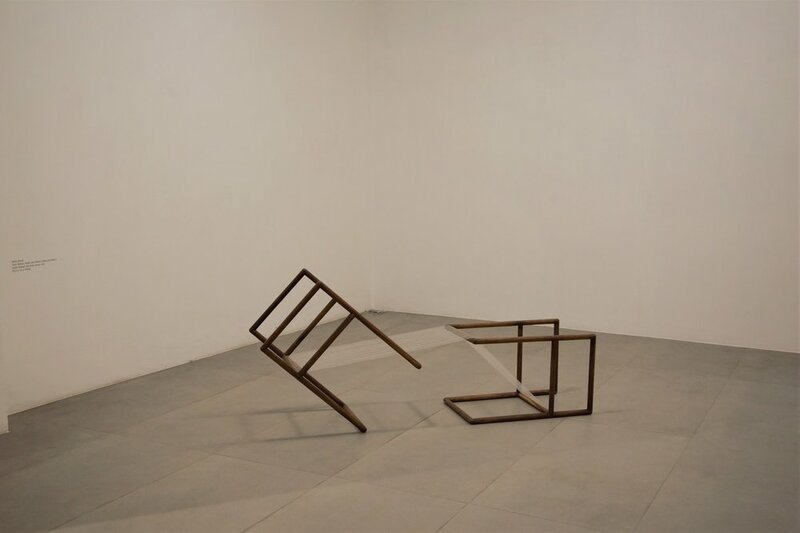 Hemali Bhuta's multi-disciplinary practice is primarily concerned with the notion of the 'in between' or 'transitory' space and the elements that contain or create such spaces. For Bhuta, 'in-between-ness' is a plane where the limitations of dimensionality do not apply and there is a possibility for transcendence. By attempting to translate one medium or form to another, her practice questions the authority that frames an interior for its own purpose. Hemali Bhuta (b. 1978) has completed her BFA from the L.S. Raheja School of Art, Mumbai and her MVA from the Faculty of Fine Arts, M.S. University Baroda. She has also pursued interior designing from Sophia Polytechnic in Mumbai. Bhuta has exhibited at Yorkshire Sculpture Park, Frieze London Sculpture Park, Parasol Unit, Arken, the 9th Shanghai Biennale, the Singapore Biennale, as well as in the travelling Indian Highway Exhibition. She was shortlisted for the Rolex Protegee Award. In addition to her practice as a visual artist, Bhuta is also the co - founder and director of CONA Foundation, an artist run space in Mumbai.